Icarus. 1971. 7 15/16x5. Engraving. 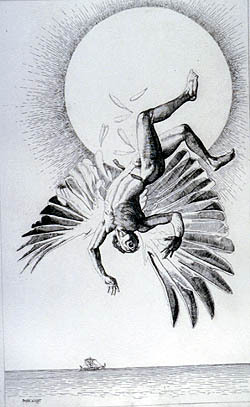 This print was based on the well-known Greek myth concerning a man, who, in his bird costume, flew too close to the sun and melted the wax that held his wings together and plunged into the sea. The model was one of Wright's students who high-jumped for hours for the preparation sketches. 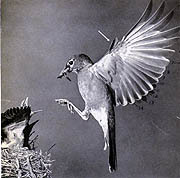 The figure was "inverted" in the final plate. The wings were created from a high speed photo in a magazine of a hummingbird. Signed and numbered by the artist in pencil. Edition of 75. Click the back button on your browser to return to the thumbnails.